From the early days to St. Louis’ founding in 1764, being up from the Mississippi River was a good thing. Namely, those who spread along the banks north & south of the original spot were subject to flooding. Those uphill from the center weren’t subject to floods. Following the cholera epidemic and fire in 1849, wealthy citizens became convinced that it was no longer desirable to live in downtown St. Louis. James Lucas and his sister Anne Lucas Hunt soon offered a solution. 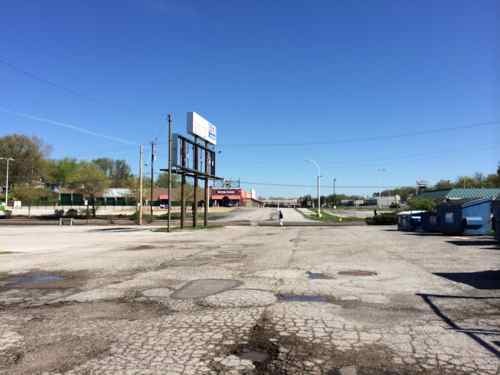 They developed the idea of the “Place,” a neighborhood with deed restrictions that ensured it remained apart from the city and general population. The main thoroughfare was aptly called Lucas Place. Originally Lucas Place (now Locust Street) extended between 13th and 16th streets when the city limits were just one block to the west between 17th and 18th streets. When established, Lucas Place was west of the developed portion of the city, making it St. Louis’ first “suburban” neighborhood. As the city’s population ballooned Lucas Place was no longer the desirable location it once was, so the wealthy moved further west. 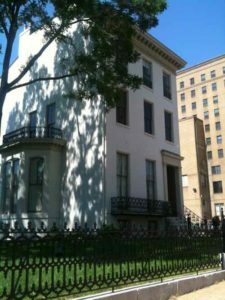 Originally, the streets around the intersection of Lindell and Grand featured row after row of stately houses, mansions, and even a private street. By the late 19th century, the area had become the wealthiest neighborhood in the city, home to some the most important members of St. Louis society. Sitting west of the central city and along major streetcar routes, Midtown proved highly desirable to those fleeing the coal-fueled pollution further east. Sitting on a hill, upwind from the central city, the neighborhood began to receive the accouterments befitting its tony status in St. Louis. Vandeventer Place, a private street on the northern edge of the neighborhood, served as the crown jewel of the rapidly expanding area. In 2014 I posted about the dire economic disinvestment in the north county area at Chambers and Lewis & Clark. Click image for May 2014 post. When three nearby Shop ‘n Save stores closed in November, it left shoppers fewer options and created what the USDA classifies as a food desert. Spanish Lake is in the northeast corner of unincorporated St. Louis County. The cities of Florissant and Ferguson are on its west side; the confluence of the Mississippi and Missouri rivers are on the east. The population is just under 20,000 and has been shrinking for decades, while the poverty rate has increased. Those who’ve been on the fence about moving elsewhere are going to reconsider. I can’t say that North St. Louis County has reached a tipping point, but it feels like it’s close. The recent non-scientific Sunday Poll was about reinvesting in areas north & south of the Central Corridor. Q: Agree or disagree: St. Louis’ “Central Corridor” (West from Arch) has always been a high priority, areas North & South should just accept this. No, we should not accept this. We can’t afford, as a region, to write off huge areas. Unfortunately, I think the regional pattern was set long before any of us were born. That’s not to say we can’t rethink our approach. I just don’t see the leadership or willpower to take on the change that would be necessary.